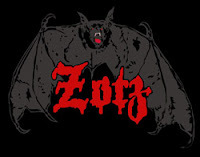 The Modelling News: Zotz drop bombs with their new B-17 decals in 32nd and 72nd..
Zotz drop bombs with their new B-17 decals in 32nd and 72nd..
Zotz present two sets of decals not produced for the 32nd scale market before – with five different colourful NMF Flying fortresses, some sassy nose art on each of them and very well researched material through Aleksa Vasa, Jeremy Kladke & Eric Swain how could you go wrong? Hey Daddy flew with the 401st BS, 91st BG, based at Bassingbourn (Station 121) Cambridgeshire, from late July 1944 to survive and return to the US a year later. 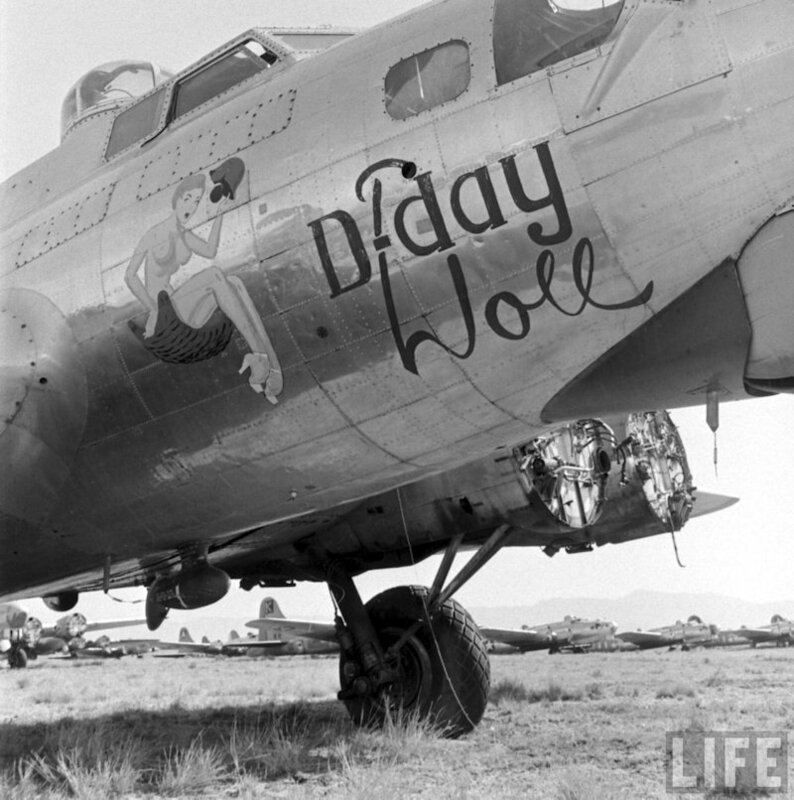 Shown here is the tail section of B-17G fortress (338036/'LL:H') 'Hey Daddy' as she heads for home after a mission. Smoke marker target indicators dropped by the next attacking formation can be seen in the distance. 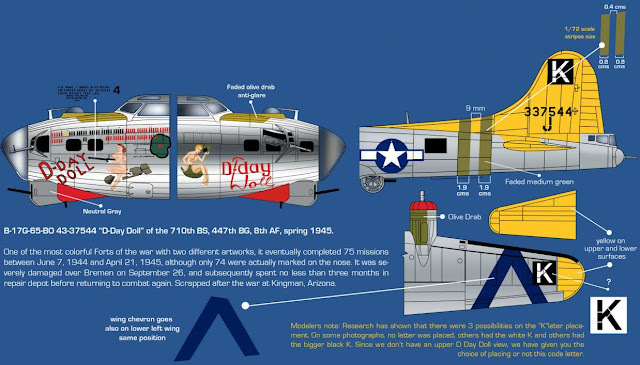 The nose artist Troy Starcer did the artwork on this plane "Hey Daddy” which flew with the 91’st BG in mid July 1944. In February 1945 Hey Daddy as withdrawn from combat and refitted with radio counter measure equipment called "carpet jammers" to mask the bomber formations from German ground radar. 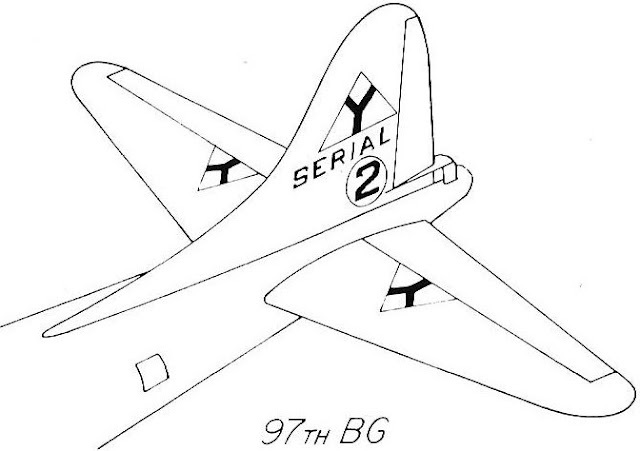 The aircraft may have been loaned to other units in the closing weeks of war but returned to regular combat flying in April when it was re-assigned to 322nd Bomb Squadron. 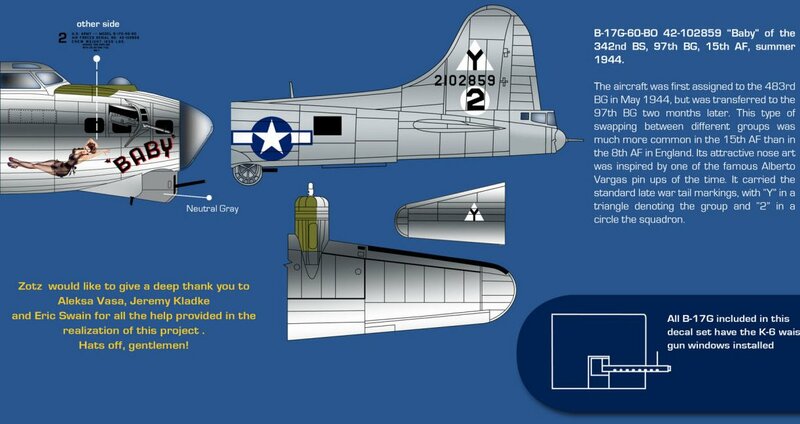 Surviving the war, it returned to the USA in June 1945 to be scrapped. 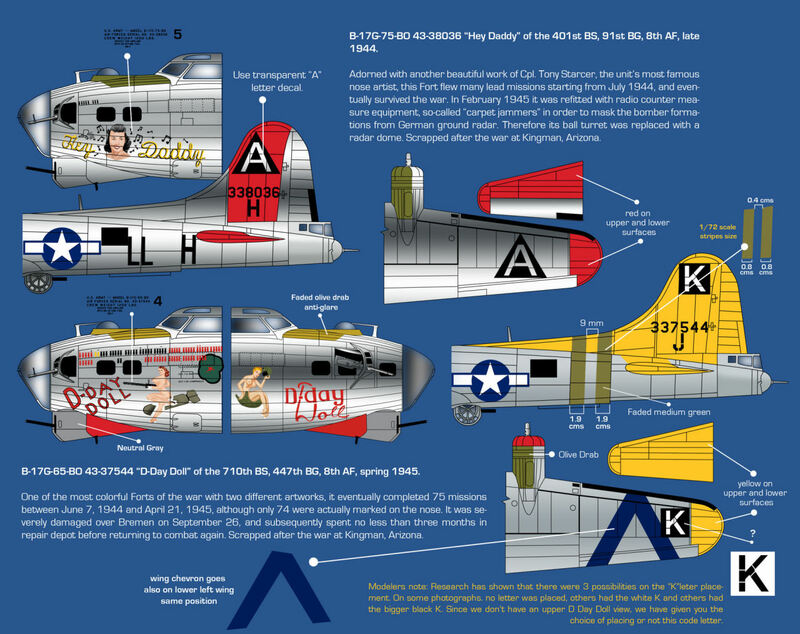 a colourful example of nose art in the 447th BG, 'D-Day Doll' flew her very first combat mission on June 7, 1944 – the day after D-Day. Photo taken after a gear collapse, probably in July or August, 1944. Inspecting damage is Sgt. 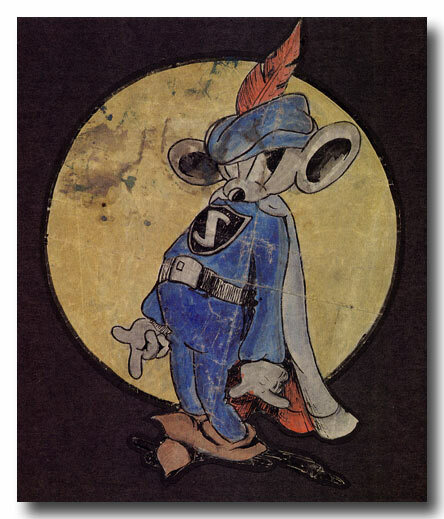 Richard Weaver, Reece crew, 710th Sqdn. 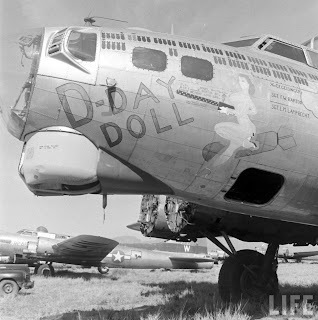 Her she is an inglorious end - "D-Day Doll" in Kingman Az. ready to be scrapped. 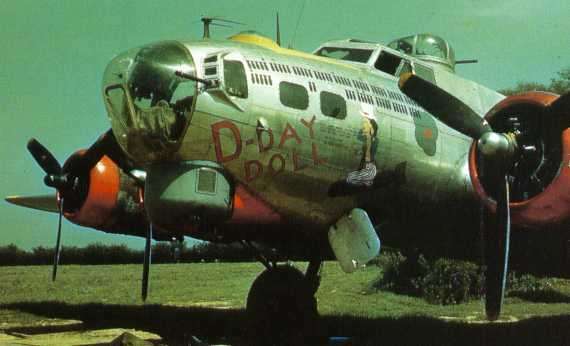 From the 490th Bomb Group '£5 with Breakfast' referred rather cheekily to the various ladies in the West End of London – often called “Piccadilly Commando’s” whom reportedly sold their services for the £5 in the aircraft’s name – but with breakfast as well! Who knows if this is true – it better have been a good breakfast! This nose art, painted by Sgt Jay Cowan one escaped the censors when other nose art designs, far less explicit, were given the order to "clean up or clean off" remains a mystery. 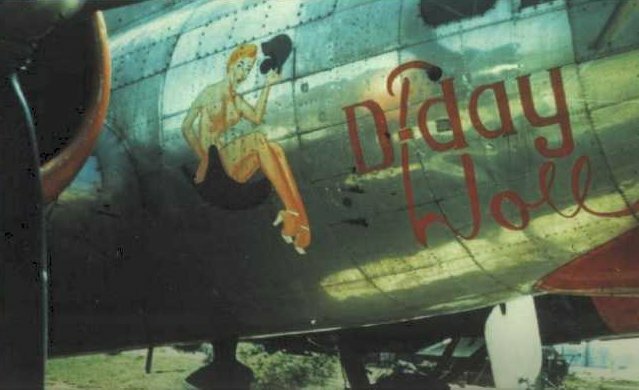 By the time this B17G landed in England in mid-October 1944, much of the more explicit nose art seen in early months of the war had been hurriedly amended, usually with hastily painted underwear or a large "censored" splashed across offending areas. 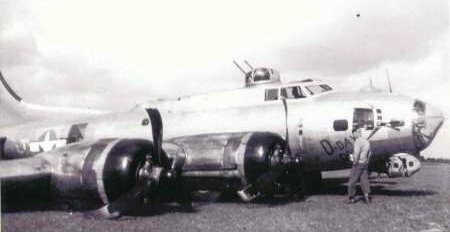 Another survivor of the air war of Germany, this B17 headed back to the USA on 9th July 1945 and ultimate scrapping at RFC Kingman. 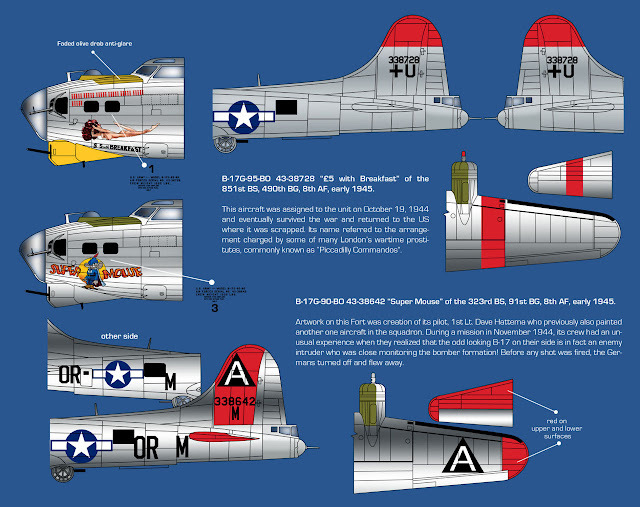 B-17G-95 BO 43-38728 $5 with BREAKFAST returned to the US in July 1945 and was issued to the 4168th BU at South Plains, before being sold for scrap in November of that same year. 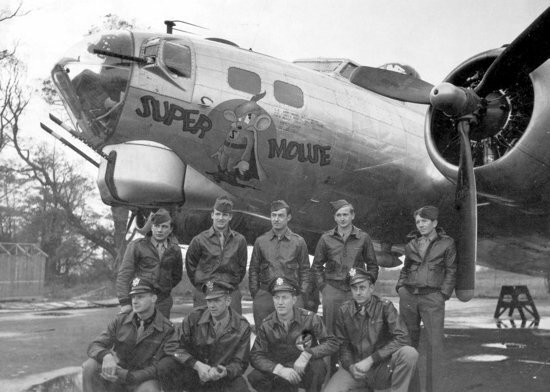 1st Lt. Dave Hettema was the pilot of “Super Mouse and also the artist who drew the nose art for this – one of the best known B-17’s in the war. The nose art of “Baby” was inspired by the pin up art of the respected artist Alberto Vargas. 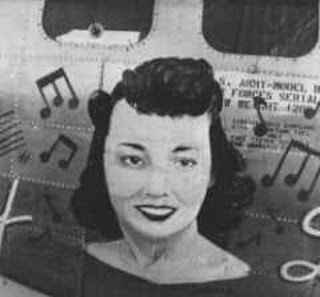 While this was a slightly darker haired lady you can see where the inspiration certainly came from!